The best metaphor I can offer for Classic Images is that this is a Greatest Hits album, complete with laudatory and biographical liner-notes in the form of a preface. I'm not complaining—there's a lot of great stuff here: Monolith, Rock and Grass, Frozen Lake and Cliffs, José Clemente Orozco, Surf Sequence, the ubiquitous Moon and Half Dome, and many others. Frankly, I would have liked it a little more if it had discussed more which "print" got chosen for presentation: Adams was an artist in the truest sense of the word, and his ideas changed over time; thus an early Adams print of his famous "Moonrise" was different from the prints he made from the same negative decades later (I am not an expert but they look like "late" images to me). Pros: Beautiful reproductions of his best-known works. Cons: Too small a format. When I was in high school I was in an after-school photography course. Not a traditional class—you showed up and worked at your own pace on assignments—some of your own choosing, or given one if necessary. And there was a fair amount of time when some of just hung around the office, like Andy and Barney at Floyd's barber shop. You never knew what was going to happen. So one day I'm hanging around in the office and the instructor handed me a book to look through. It was an industry book—a collection of images from commercial photographers, along with contact and capabilities. Photographers would show their fancy work in this book, hoping some advertising guy would hire them for their next shoot. So why was I looking at it? Ideas. 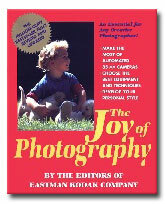 The Joy of Photography, More Joy of Photography and its other sequels are big idea books. 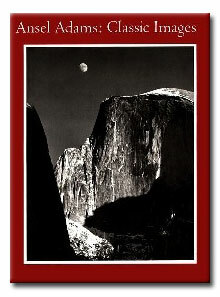 They're collections of photographs that have been categorized to try and expand the reader's imagination. One could find a page called "Bird's Eye View" where the photos are all taken from a high vantage point, and the next page is "Worm's Eye View" where the camera is own the ground and angled upward. Flipping through More Joy, "Selective Focusing," "Blurring: Unfocused Subjects," "Blurring: Moving Subjects," "Panning," "Jiggling," and "Freezing Action." Sounds elementary—and it is—but at the same time it does suggest things to try. Every time I look through these books I find something that gets the wheels turning (such as "Blacklight Photography," as I type this). Pros: Great source of inspiration and ideas. Cons: Photos are very Kodakie—if you know what I mean. I went through a period of a couple years when I listened to the Imus in the Morning radio show, and Don (the radio personality) was in various stages of making this book. He would talk seemingly-endlessly about his prowess with a Nikon and a Hasselblad, and had he not been a radio DJ he could have been a professional photographer. So when the book finally hit the shelves, I eagerly got my hands on it to see how much B.S. it all was. 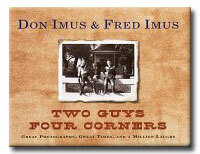 The result was a minor revelation—not so much that the Imus brothers, dj Don and mail-order/salsa maker Fred, really could make presentable images (they did—their slot canyon images are as beautiful as any I've seen)—it was that the captions they wrote that made me buy and treasure this book. Consider this one for Blue Mesa: "Fred insisted that I was wasting my time photographing what is a) not a mesa, and b) not blue. This very fine shot proves that Fred is a sour old fool with an unfortunate attitude and limited vision." Or this comment on Fred's disinterest in recording exposure information (accompanying Hitching Post, Monument Valley: "A great shot. Want to know how it was taken? f-stop? Overexposed? Underexposed? Call Fred: 1-800-272-1957." Photographers managed to pick up all the bad habits of other "serious" artists, and the result is that far too-damned-many of their books are pretentious or humorless or both. So it was great fun, along with the initial shock, to find a book of serious photography accompanied by far less serious blurbs. Some of the comments, such as those previously quoted, will last—others are more topical (more than one reference to Bill and Hillary, the Dave Thomas comment will be an enigma to future generations). Plus there are a few very obscure jokes—the "old squaw" from At the Chaco Canyon Anasazi Ruins is actually Don's wife Deirdre, and the phone number quoted above rings Fred's mail-order business call-center. Still, the vast majority of the comments work well, and the images are beautiful. I was surprised and saddened to have recently seen this book on the remaindered table at one of the major booksellers (especially since I paid $26.95 for it when it came out)—if you're so lucky to find one at close-out price, it is a bargain as well as a treasure. Pros: Best blurbs ever accompanying surprisingly good photographs. Cons: Topical humor goes stale as time goes by. 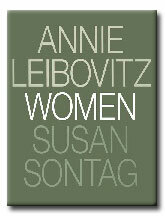 Annie Leibovitz is arguably the most famous living photographer living of our time. Her photos of celebrities for Rolling Stone have often become the "definitive" image. She moves easily from slick, glossy color work to fine-art B&W. In short, she can do it all. Photographs is my favorite—a collection of celebrity photos. Many of these photos strike me as being gimmicky—Woody Allen wearing a plaid shirt, standing against a wall of red-and-white vertical stripes. Dolly Parton in full regalia striking a feminine, serpentine pose, Arnold Schwarzenegger's massive arms and legs extend outward behind her. Bette Midler lounges in a sea of roses. Tomlin weeps and Pryor grimaces. 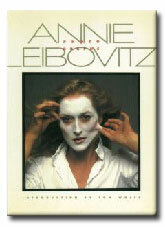 I am a notorious page-flipper and easily bored; my respect for Leibovitz comes finding it very difficult to turn past any page without giving it a serious look. I've never met any of these people and I do not pretend to get a sense of their true selves—what I get from this book is a great sense character—the person each is trying to be: Tom Wolfe the dandy, John Belushi the blue-collar joe you'd likely bump into at the bowling alley, Redford the cowboy beachcomber. Women is much more of a mix. There are celebrities and nobodies, B&W and color, some are obviously staged, but many are candids. The range appears to be as broad as possible—they only limit being that they are all women (including the obligatory gender-bender). American Music is a series of photographs of musical celebrities, grouped roughly by their genre (blues, country, hip-hop, rock, jazz, a nd their various flavors, shadings and fusions). Some are B&W, some are color; all are powerful. She has a great ability to create a great image, and such flexibility that she can put 100 photographs together without redundancy. They're an incredible synthesis of form, texture, tone and character. I don't follow popular music much—I recognized probably half the names and only a handful by image. But it doesn't matter—this could have been Livonian Music and I would have reacted the same way. 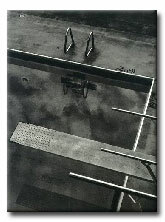 Olympic Portraits exhibits Leibovitz's mastery of B&W, the only color is in the text. Again there is the great range—from posed portraits to action shots to a striking shot of gymnist John Roethlisberger's hands. There are a few famous atheletes here: track's Carl Lewis, boxing's Floyd Mayweather and basketball's Grant Hill; but most of the rest will only be remembered by their friends or ardent fans, which makes the images of the hopefuls, the people who strove in obscurity and never sniffed a shoe, cereal or chewing gum endorsement, a little more heroic. Even more admirable is the breadth of endeavor. In addition to the darling sports in the US, gymnastics and track, Leibovitz includes many images from the sports that only run on cable in the middle of the night, if at all—Alexandra Harbold prepares for kayaking, Lily Yip and Jim Butler play table tennis, Kevin Yip makes a spectacular jump in badminton, Sgt. Teresa DeWitt stands by with her 12-gauge in the double-trap event. Writing this review reminds me that I need to find more of Annie's books. Pros: Candy that won't make you gain weight or rot your teeth. Cons: Some of these books are very expensive, particularly Photographs, which is long out of print. ©opyright by James Ollinger All rights reserved.